Are you searching for a tool that boasts many great benefits with virtually no drawbacks? Then you’re in luck as the Cromar Leadax- Second Generation Lead Alternative Scissors are precisely the product you’ve been searching for. You’ll find that we stock this product in large quantities to ensure complete availability. Plus, we’re confident you won’t a better price anywhere else. The Cromar Leadax- Second Generation Lead Alternative Scissors are the only pair of scissors you’ll ever need. Each pair has been built using premium-grade materials that will stand up to the rigours of day-to-day usage without breaking or jamming. The blades themselves are high-quality and will last you for many projects before they’ll need sharpening. Cromar Leadax- Second Generation Lead Alternative Scissors are designed to cut Leadax lead-alternative products quickly and easily. They will enable you to shape and re-size these products to your exacting specifications – no mess, no fuss. 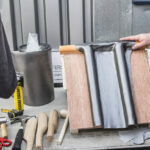 The beauty of Leadax lead-alternative products is that they are among the first lead-alternative products to boast all of the benefits of traditional lead without any of the drawbacks. These scissors are the perfect tool to use with these products, and they are perfectly simple to use with no special training required. In no time you’ll be producing professional quality results, even if you’ve never handled a pair of these scissors before in your life. So, what are you waiting for? If you’re searching for a hard-wearing, reliable and affordable pair of scissors, look no further than the Cromar Leadax- Second Generation Lead Alternative Scissors. On our website, you’ll find all prices listed inclusive, and exclusive of VAT so you can budget more effectively. Better still is that you’ll enjoy a highly competitive delivery estimate of just 3-5 working days.